As AUM swells to $8 trillion, advisors are asking: What’s next for our practices? “Never waste a crisis” is the popular political dictum. When the status quo is in question and people want assurance, it’s often the best time to introduce change. It’s hard to imagine a bigger crisis in personal investing than the 2008 market collapse. Home values peaked in early 2006 and fell substantially over the ensuring months. A brutal bear market in stocks followed, bottoming in March 2009. The U.S. economy quickly entered the Great Recession. Naturally, a lot of people sought assurances about their money. We still feel the lingering effects. The Federal Reserve only now is timidly stepping away from rock-bottom interest rates, more than eight years later.In the midst of it all, assurance came from an unexpected quarter — online financial advisors, the so-called “robo” advisor business and pioneered by my firm MarketRiders, which launched in 2008. In a real sense, the whole idea of online financial advising is anathema to the history of the business itself. The long-standing marketing principle of investment advising is that graying sideburns and a gentle bedside manner are required. Who gives their money to a kid right out of business school? The leap of faith from that kid to giving your money to a machine — to an algorithm built by strangers and operated from afar — is a staggering proposition. Yet people did it. 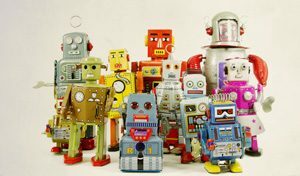 Robo advisors will double assets under management to $8.1 trillion by 2020, according to one analysis. That’s compared to $74 trillion managed in total by wealth managers today. Robo will handle 10% of the market just three years from today. Startups such as Betterment, Wealthfront and Personal Capital also will figure, to name just a few in the now-busy space essentially created by my firm. Broadly, that’s where things are headed: Investor will choose either a pure do-it-yourself machine product or, at a slightly higher price point, a human advisor using robo tools and offering personalized care and advice. To get a better idea of what will come next, let’s take a step back and review how other industries moved toward low-cost, client-operated strategies. From there, we might reasonably predict the outcomes for robo advising in the near- and medium-term. The convergence of the computer age and stock trading, in retrospect, seems inevitable. The earliest consumer-level computers were in stores in the early 1980s. Within a decade the first dial-up Internet Service Providers, such as early giant AOL, had begun to make inroads into consumer consciousness. Schwab and Scottrade were among the earliest discounters online, driving commissions from nearly $50 a trade down to $7. The price drop coincided with a sea change in investing as well, as millions of Americans moved from pensions to having to choose investments for 401(k) and IRA plans. The migration to self-managed retirement investing gave rise to the mutual fund industry, of course, but it also fostered the online trading business as well, a trend that discounters fueled with competitive commissions, today under $5 a trade. The 1990s was the decade, too, that index investing took hold in a big way. Started by John Bogle at Vanguard in 1976, these ultra low-cost competitors to mutual funds now manage $2.2 trillion, in 2015 reaching 22% of mutual fund assets. Takeaway: Ultimately, investors were served by low-cost products, while technology gave them the tools to select and manage those products. It’s an open question how deep low-cost trading and index funds will cut into the industry, but it seems likely that the big players will invest even more into the category as customer adoption becomes widespread. The rise of online banking tracked right along with discount trading, thanks to many of the same factors, such as mass computer ownership and the popularity of the Internet. As with online trading, it was the big market participants who pushed early for non-branch banking services at home, players such as Citibank and Chase. But it was small credit unions that invested in complete online banking suites. The first completely virtual bank — with no branches at all — was Security First Network Bank in 1995, followed by NetBank in 1996. Virtual banks were attractive because they offered higher interest rates to their customers, thanks to lower operating costs. Online giant Ally Bank was born from the ashes of GMAC in 2009 (never waste a crisis, right?) and now nearly all banks and credit unions today have robust online divisions. Takeaway: Low cost was part of the equation for banking, but people also appreciated convenience and easy access to their accounts. The dramatic shift from desktop computing to tablets and mobile banking has only increased demand and thus competition for that demand, lowering costs further. Have you called a travel agent lately, or even once since 2005? The airlines pioneered mechanized booking systems as early as 1946. In the 1950s and 1960s, airlines seeking to reduce costs created their own systems for reservation management. Travel agents, perhaps unwittingly, campaigned for access to those systems, gaining entry in the mid-1970s. Fast-forward to the 1990s and the Internet and you can see how turning over the process of booking and paying to clients was inevitable. Who wants to pay the agent to press buttons? Hotels followed suit. Now nearly 60 million of us book online, generating $533.5 billion in sales with no intermediaries other than the website operators themselves. Discounters such as Hotwire and Priceline have taken over the inventory market, while aggregators such as Kayak and Trivago have created virtually transparent market pricing. Knowing the price before you pay has been a boon to consumers. They now easily comparison shop and even use algorithms on phone apps such as Hopper to time airline purchases in order to capture the lowest price based on live seat demand. Takeaway: Choice and transparency, once they are offered to the consumer, are no longer a competitive edge for service providers. Transparency becomes the baseline and its back on price to attract buyers. Low cost, convenience and transparency. That is the takeaway from more than 20 years of Internet-driven change in a variety of industries. So how does all this apply to the nascent robo advisor approach to investing? Advisors should not assume that the “standard” 1% fee based on assets under management has a long shelf life with most investors. Its sell-by date definitively has passed. That said, robo advisory alone cannot match the personalized service for sophisticated solutions that most advisors are able to provide. The good news is that there is a happy medium. Advisors can avail themselves of the lower-cost robo technology for some clients while providing sophisticated solutions to their high net worth clients based on their standard fees. Meanwhile, separate, high mutual fund fees are becoming indefensible. Increasingly, fund fees are perceived by the customer as a drag on return. There will be enormous pressure on advisors to explain the value of fees or shift client money to index funds or low-cost, index-style exchange-traded funds — or give up their own fees to compensate. Advisors used to making quarterly or annual reports will be expected to communicate more frequently. Advising will have to be both high-tech and high-touch. Managing client expectations will be huge. A pure do-it-yourself investor is likely to understand the day-to-day volatility of a portfolio. The less-engaged retirement investor, however, will need human contact and advice. Risk management, rather than economic forecasting, will become a prominent topic in client communications. Transparency on fees and commissions will become standard practice, regardless of your stance on fiduciary regulation. The investment management industry is likely living in the last days of the 1990s as experienced by other industries today made flatter, cheaper and simpler by the Internet and the information revolution.